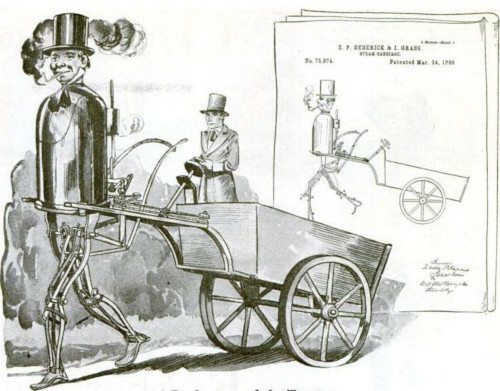 In middle 1860s, Zadock (he always spelled his first name as Zadoc, whereas other official documents have him as Zadock) Dederick, a young machinist from Newark, New Jersey, and his fellow-citizen Isaac Grass invented a steam carriage with a man figure, which can be considered as the first American robot. In 1868 Dederick demonstrated the so called Newark Steam Man before thrilled spectators, including the governor of New Jersey, exposing the prototype on Brodway Str., New York. In 1869 the Steam Man has been exhibited in Boston, Chicago, St. Louis, New Orleans, and Fort Wayne, Indiana. The machine was so inspirational it generated many more walking machines, steam or otherwise, and also fictional stories, like the famous dime novel The Steam Man of the Prairies by Edward S. Ellis. On 24 March 1868, Dederick and Grass obtained a patent for their invention (see US patent 75874). Mr. Zadock Deddrick, a Newark machinist, has invented a man; one that, moved by steam, will perform some of the most important functions of humanity; that will, standing upright, walk or run as he is bid, in any direction, and at almost any rate of speed, drawing after him a load whose weight would tax the strength of three draught horses. The history of this curious invention is as follows: Six years ago Mr. Deddrick, the inventor, who is at present but twenty-two years of age, conceived the novel idea of constructing a man that should receive its vitality from a perpetual motion machine. The idea was based on the well-known mechanical principle that, if a heavy weight be placed at the top of an upright slightly inclined from vertical, gravitation will tend to produce a horizontal as well as vertical motion. The idea was unsuccessful. However, by observing carefully the cause of failure, persevering and perfecting the man-form, and by substituting steam in place of the perpetual motion machine, the present success was attained. The man stands seven feet and nine inches high, the other dimensions of the body being correctly proportioned, making him a second Daniel Lambert, by which name he is facetiously spoken of among the workmen. He weighs five hundred pounds. Steam is generated in the body or trunk, which is nothing but a three-horse power engine, like those used in our steam fire engines. The legs which support it are complicated and wonderful. The steps are taken very naturally and quite easily. As the body is thrown forward upon the advanced foot the other is lifted from the ground with a spring and thrown forward by the steam. Each step or pace advances the body two feet, and every revolution of the engine produces four paces. As the engine is capable of making more than a thousand evolutions a minute, it would get over the ground, on this calculation, at the rate of a little over a mile a minute. As this would be working the legs faster than would be safe on uneven ground or on broad street cobble stones, it is proposed to run the engine at the rate of five hundred revolutions per minute, which would walk the man at the modest speed of half a mile a minute. The cost of this “first man” is $2,000, thought the makers, Messrs. Deddrick & Grass, expect to manufacture succeeding ones, warranted to run a year without repair, for $300. The same parties expect to construct, on the same principle, horses which will do the duty of twelve ordinary animals of the same species. These, it is confidently believed, can be used alike before carriages, street cars and plows. The man now constructed can make his way without difficulty over any irregular surface whose ruts and stones are not more than nine inches below or above the level of the road. He Arrives in New York and Astonishes the Metropolitans. Mr. Steam Man is a person of commanding presence, standing seven feet nine inches in his stocking vamps, weighs 500 pounds, measures 200 inches round the waist, and [is] decidedly bucolic in general appearance. At this early hour in the morning he was rather in dishabille, and minus his pants. This circumstance, though detracting rather from his comeliness, was yet more than counterbalanced by the greater facilities it gave for the study of human anatomy, and was eagerly availed of for that purpose. The legs are made of iron cranks, screws, springs ad infinitum, not quite as attractive in exterior as those we see in the weekly pictorials, but evidently of greater durability and strength. The motion of the legs is almost fac simile to that of the human extremities, and the manner in which they are set agoing strikingly calls to mind the philosophic apostrophe of the human donkey to his namesake, “How fearfully and wonderfully we are made.” The abdominal region is occupied by a good-sized furnace, which was in full blast. The steam man’s boiler is delicately concealed from the profanity of the public gaze, but is presumed to be somewhere above the furnace. This complex piece of machinery once got out of order, but was happily restored after a careful investigation of the cause and the application of the appropriate remedy. The steam whistle is fixed in his mouth, the gauge at the back of the head, and the safety valve in an appropriate position. He wears a large stove-pipe hat — stove-pipe literally, for it is through the cranium the funnel passes. His hands are gloved, a good moustache ornaments his face, and in outward garb he is rather good-looking than otherwise. The steam man proper is but the figurehead, as it were, of a handsome phaeton, capable of accommodating four persons, together with a tank to contain half a day’s supply of water and a bunk for a day’s coal. 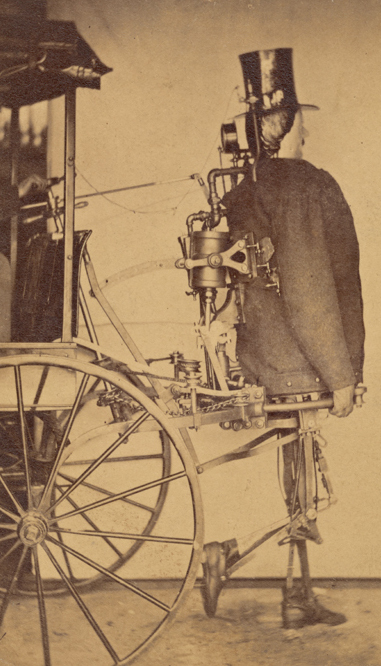 The entire driving machinery is at the rear of the steam man and within easy grasp of the driver seated on the front seat, who at any time can increase or diminish the speed, turn, stop, curve, etc. Twenty pounds of steam will set the man in motion, and twenty cents’ worth of coal will work him for a day — so the inventor avers. It was the original intention of Mr. Dederick to have exhibited the steam man to-day in full running motion, but this he says would not be permitted by the insurance company. He says that he can easily accomplish a mile in two minutes on a level course, and offers to test this on Long Island Course as soon as the weather gets fine. The engine is four-horse power, and the man takes thirty inches in each stride. Perhaps the most extraordinary attribute of the animal is the faculty of stepping over all obstructions not higher than a foot. (Of course, all these assertions are the inventor’s, and not the result of the reporter’s investigations.) It or he may be detached from a phaeton, and yoked to a sleigh or any kind of wagon. Mr. Dederick is ready to procreate steam men at a cost of $300 apiece. He will also shortly produce a steam horse adapted to plowing and the heavier kinds of draught and burden. Whether the steam man prove of any practical good or not, he is unquestionably a great curiosity. Little is known about the inventor Zadoc Dederick? Zadoc (or Zadock) Pratt Dederick was born on 8 August 1849, in Hensonville, Greene County, New York, USA (strangely, in the article of January 1868 he was mentioned as "twenty-two years of age", so probably his year of birth was not 1849, but 1846). Zadock was the son of William Henry Dederick, and Harriet Dederick (Bailey) from Greene, New York. William Henry Dederick (1 Jun 1806–25 Apr 1870) married to Harriet Bailey (24 Apr 1819–10 Jun 1857) in 1838, and they had 7 children: Emory, Eleanor (1841-1895), Henry (1842-1918), Harriet (born 1845), William Richley (1848-1848), Zadock Pratt (1849-1923), and Ethan (1852-1854). Zadock was most possibly named after the famous US tanner, banker, soldier, and member of the US House of Representatives, Zadock Pratt Jr. (1790–1871). According to the Newark City Directory from 1868, a Zadoc P. Dederick, occupation pattern-maker, resided at 87 Spring Str. in Newark, NJ. Later he worked as a patent attorney, and tried to commercialize his Steam Man, but it never turned into a business success (it was too expensive to produce). In 1876, Dederick moved to Sherman, Grayson County, Texas, where he lived until his death. In Texas he founded the company The Dederick Well Machine Works of Sherman, Texas, a manufacturer of well drilling machinery for the burgeoning oil industry and other uses. Besides the famous patent for Steam Man, Dederick was a holder of another US patent (Nr. 845765 from 1907) for Automatic mail and parcel delivery apparatus. Zadoc Dederick was married three times: Mary Elizabeth Fleming of Mississippi (1850-1881), Flora Bernard and Ada Cole of Missouri (1878-1953). He had (at least) 10 children: William Henry (1873-1961), Zadock Pratt (1878-1921), Tudie (1891-1986), Lucie (1893-1974), Thaddeus (1901-1955), Mary Elizabeth (1895-1996), Iona (1903-1981), Marion (1909-1974), Marshall Allen (1911-1957), and Magdalen (1913-1997). Zadoc Pratt Dederick died on	22 February 1923 (aged 73), in Sherman, Texas, and was buried in West Hill Cemetery in Sherman.